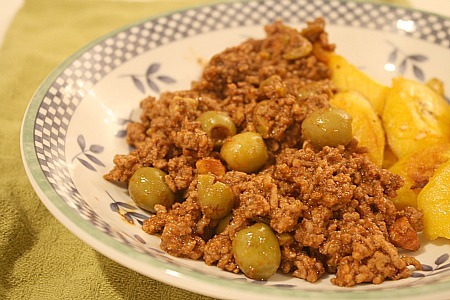 Yeah, I know, I already have a Picadillo recipe on my blog…but this one is equally as delicious, and it’s Whole30 compliant. Can’t beat that! The almonds add great texture to this dish. I served it with fried plantains, as you can see. Delish! Brown beef in a pan. Add garlic, spices, bay leaf, tomato paste and water. Mix and bring to a boil, then reduce to simmer. Cover and simmer for 20 minutes. Add a little water if you feel mixture is too dry. Add olives and simmer another 10 minutes. Turn off heat and add almonds. Stir and serve. This entry was posted in beef, freezer friendly, low carb, main dishes, make ahead, nuts, QuickAndEasy, Whole30. Bookmark the permalink.